Unfriended: Dark Web (R) is in theaters now. This is one of those movies that’s incredibly creepy because you don’t need to suspend your disbelief to imagine this could happen in real life. The film takes place entirely on computer and phone screens, and shows how susceptible we are to dark forces lurking on the internet. A group of friends is in serious danger when one of them acquires a new laptop and discovers the previous owner was into some nasty stuff. They’re now being watched, and have been pulled into a world they never even knew existed. The reality of it all is quite frightening. 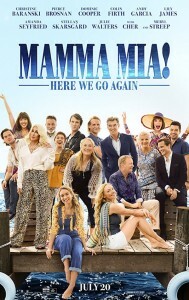 Mamma Mia: Here We Go Again (PG13) is in theaters now. This movie serves as both prequel AND sequel, although the present day timeline is a little out of whack. The bulk of the action takes place in 1979, giving us the story of how Donna met Sophie’s three dads and ended up staying on the island. The prequel cast is a fun bunch, and Lily James shines as young Donna. The original cast is back for the “present day” scenes, where Sophie is hosting the grand opening of her mom’s dream hotel. There are some questions left unanswered, but with good comedy, great musical numbers, a bunch of less familiar Abba songs (and some favorites from the first film), this is a fun summer feel-good movie. Cover Versions (R) is on Hulu. The mystery unfolds as we hear different stories from four bandmates, about one deadly night. StarFoxy is set to play their first big festival the next day, when fans come to party and wind up dead. As the story builds, the deception escalates, and our allegiance for the characters changes with every turn. 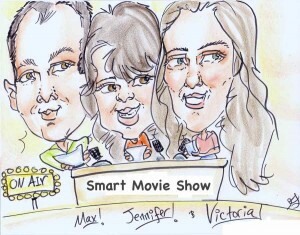 This film starts a bit slow, but has great twists and turns, with a familiar cast we know from much lighter fare. Angie Tribeca (TV14) is on Hulu. This comedy series started on TBS, but will be airing the upcoming 4th season exclusively on Hulu before heading to cable. With a great cast and amazing guest stars, this cop spoof show is a throwback to Police Squad, The Naked Gun, Airplane, Hot Shots and more. Nothing is sacred and everything is a pun – pay close attention or you might miss a good joke. This is the kind of LOL funny we didn’t know we really needed. Kudos to creators Steve and Nancy Carell! We’ll give you a heads-up when there’s a premiere date for season 4.